Hello and welcome to Handmade Monday in its new home! I feel like I've moved house, but without all the cardboard boxes. If there are any blips I might not be aware of, please feel free to email me: wendy@1stuniquegifts.co.uk - but let's hope it all runs smoothly! You've probably found us here from over on my other blog - if that's where you've come from then you came to the right place and it's lovely to see you! This week has been an odd one, and it looks set to continue this way for a while. I've been busy with customer orders and new designs, but also busy writing a book (only a small one for the first one! It will be an e-book when it finally is ready for public consumption!) as well as designing sewing patterns. There are definitely not enough hours in the day and not enough space in either the house or the studio. I'm slowly beginning to learn that everything doesn't have to be done immediately. It's a big lesson for me! which you may notice was inspired quite heavily by one of my painted designs! 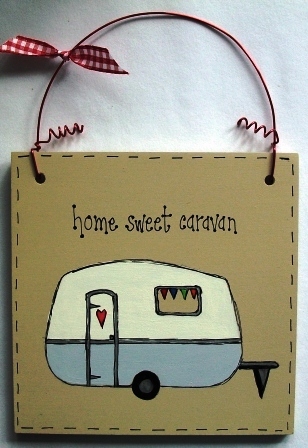 The little painted caravan plaques have been a popular gift idea and have started selling again recently with people thinking about summer, I guess. Let's hope the sun does start shining soon - I'm thinking the uninvited pond which seems to have made itself at home in my garden may well become a permanent feature. I'd love to get the lawnmower out but I guess underwater mowing isn't really recommended is it? What have you been up to this week? I'm looking forward to finding out. There's more info about Handmade Monday here if you're new and want to join in. That's my kind of move, no packing, just a gentle transfer to the new place. Absolute bliss - well done. I do like your caravan doorstep and plaque - I can see a whole range of similarly decorated items on the way. Our mud bath has subsided and we actually managed to get the lawn(lawn??? grass) cut today. Hope yours dries out soon. Have a good week. Thanks for the new link to your lovely new page great blog as usual. that sign is so cute :) what a fun idea to turn it into a doorstop too! Our house seems to have developed a moat and I am seriously contemplating asking my husband to make a drawbridge so that I can keep my feet dry when I attempt to get to the back door! I love the caravan doorstop, fabulous! And thank you for a smooth move to our new home. Lovely doorstop Wendy, a great addition to go with the plaque. Hi All - I loved the VW camper I had when my girls were small - happy days! 25 years ago it was safe for them to play out the front, using the van as a playhouse. We all loved going off camping in it. Lovely doorstop. Will have a look around that Craftsy site soon. Caroline: haha, a pond isn't part of the grand garden plan - grandkids and ponds not a good mix unfortuntely! Free Spirit: Love the idea of being in 2 places at once! Kazie & Ros: As you may imagine, my campervan imagination is running riot with stitched designs. The doorstop is only one of them. Your VW is very cute! I love all things Campervan! Although I don't fancy staying in one with a very mobile toddler. Lovely makes there Wendy! A book?! How cool is that. You always seem like the busiest person I know. Love the doorstop, how cool is that? Hi, sorry I haven't been around for a long while, but I see you have picked up lots of new names, I look forward to visiting them. Oohhh can't wait to try out the pattern, I love the caravan! Great doorstop! And Congratulations on the move. oh my goodness! this caravan doorstop is fantastic! for me its just too nice to be used to prop the doors! it would definitely end up somewhere nice on my shelves! too pretty to be kicked around! Not managed to participate this week. Rather a lot going on in my life at present. Glad the virtual move went ok. Liking your caravan door stop. Would look good as a toaster cover to. Hugs Mrs A.
Wow! That's exciting about the book. 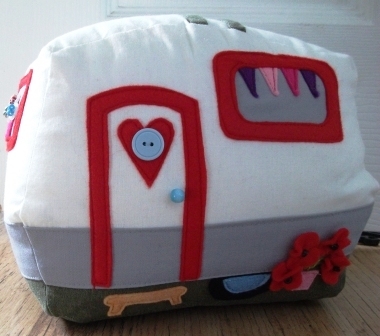 Your caravan looks great - I've just signed up for Craftsy too. Love the doorstop its fab!